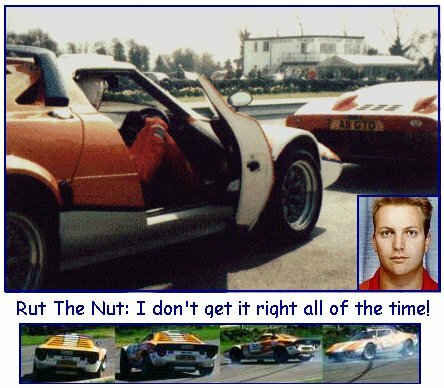 For those that have not yet heard of me, or read any earlier reports, my name is John Rutter and the kit car that I drive is an HF3000 from Hawk Cars– an accurate replica of a Lancia Stratos. This car has been running for over five years now, being built initially for fast road work with the intention of some track use. This follows on from enjoying many track days with my GTV6 as a member of the Alfa Romeo Owners Club. The Alfa link was followed through with my choice of engine for the Hawk HF, as I went with the three-litre V6 from an Alfa Romeo 164. I’m pleased to say that not only have I found that this engine is ideal for the car, so have a fair number of other replica owners who have converted from other engine types, or built their own cars from new with this power unit. After all, this may be a kit car, but it is Italian in origin and has an Italian heart – Cuore Sportivo as Alfa Romeo like to say. When first completed, back in 1995, the car passed an MOT test on the Wednesday and was at Castle Combe for a Kit Car Action Day on that Saturday. The drive to, from, and around the circuit was simply something else. The response from the car to driver input was quite amazing. It was a real surprise to see the looks of admiration from members of the general public as this space-age design is driven on the road. Those who know of the Lancia Stratos are usually pleased to see one on the road, but the futuristic design is such that others would never guess that this is a car design from the seventies and that it was produced by a mainstream manufacturer. As for driving the car itself, the steering was kart-like in it’s directness, the ability to change direction so rapidly was another level above any other car I had driven and the throttle response and pick-up from the engine just enhanced all of the handling attributes. There were negative points to the car too, since it was noisy (due to running on rose-joint type suspension and having no interior trim or soundproofing), it would tend to follow irregularities in the road surface and it did not track perfectly straight at high speeds. A number of these attributes improved with subsequent changes in tyre pressures and suspension geometry alignment. Some of the faults are still there to this day, as it is still noisy inside and it does still try to follow lines on the road, but they are not points of concern to me. The plus points are all still present though. Length 146", Width 69", Height 43"
As an active member of the Stratos Enthusiasts Club, I attend various shows and meetings, although my preference is for locations where I can actually use the car – not just stand	back and look at it. I might point out that I have never been the type that could put in the effort needed to run a car in concours condition but I do admire	those who do. On the other hand, I do try to ensure that my car will run at least as fast as anything else that I come across and always looks presentable and purposeful. In 1996, I entered a couple of ‘sprints’, at Lydden and Goodwood, to see how those events are run. The class that the HF3000 competes in for these speed events is for Kit Cars and Replicas over 1700cc. This put me in with the Westfields and Caterhams using 2-litre Vauxhall engines. For brief comparison, my car weighs 900 kilos and at the time had a standard V6 that was quoted at 190bhp when new. The Sevenesque vehicles would often weigh between 600 and 700 kilos with engines tuned to develop 250bhp and more. Naturally, there are some that do not reach these figures, but all are renowned for being quick and responsive cars with a competition pedigree. A particular choice of words that, since the same description applies to the Stratos – it was designed with competition in mind, with a mid-mounted engine for traction and ‘low polar moments of inertia’. Now is not the time to explain all the effects that has in terms of handling, but suffice to say that it means the car will change direction rapidly – whether that is what the driver intended at the time or not! Onto the bragging section next (about the car if you like, not necessarily the driver). I found that I liked sprints and hillclimbs, with these events being both friendly and competitive. The car proved to be well suited to this form of competition too, resulting in a class win on only my second time out. For 1997 I decided to enter the ACSMC and CCC speed championships and competed in many more events, although choosing only the Southern events. Through this year, there was only one other car in the class that I did not beat and that was the Westfield of Trevor Willis. That wasn’t too bad, as Trevor ended up a multiple winner of the CCC Championship. For my efforts, I won my class in the ACSMC Championship that year. My next idea for the car was to take up circuit racing, although mindful of the cost and potential for serious damage to the car. After all, most fast drivers would relish the chance to race properly, wouldn’t they? Auto Italia magazine promote the BRSCC Italian Intermarque series, which accepts kit cars and replicas as well as all vehicles Italian. This means a combination of Alfas, Lancias, Fiats, Maseratis, Ferraris and de Tomasos all racing together. A number of kit cars compete too, which must all use running gear from an Italian donor car. This means that there is an Alfa-powered Clan Clover and a Minari, as well as both Hawk and CAE Stratos Replicas. A Lamborghini-powered Foreman P4 is also planning to compete in the series for this coming season. A number of jobs needed doing on the car to take up circuit racing, for safety first and performance second. This meant that door bars had to be fitted to the existing roll cage, a plumbed in fire extinguisher was installed, and using a six-point harness rather than the four-point unit. The battery was moved from the engine bay to the front of the car, an undertray was fixed in the under-bonnet area to help management of the radiator airflow and cooling ducts were made up for the front brakes. As the race series runs on slick racing tyres, bigger vented disc brakes were put in place both front and rear to make the most of the increased grip that would be available. A new engine was obtained and rebuilt with ‘fast road’ camshafts and a new ‘chip’ for the engine management system. This chip provided an extra 1000rpm rev limit, raising it to 7250rpm before it cut in. A stronger clutch cover was fitted, the flywheel lightened and some minimal gas flowing performed on the air meter and intake components. The internals of the engine were otherwise left completely standard, now producing 210bhp. I started my first circuit race at Brands Hatch without ever having driven on slicks (report in Kit Car magazine, July 1998). I ended my novice year as the Auto Italia Championship Winner in Class B, for modified cars in the two-to-three litre bracket. I can put the result down to a combination of speed and reliability, with the car not showing any problems. The following year, the class structure changed so that the top class was for modified cars over two litres. This included the Ferraris and any other outright race cars, but I actually went on to win this class too. And that in a car that was still, legally, used on the road as well as the track! For 2000, work commitments meant that I could not compete in the full championship, so there are no results to list for that season. I did however include a number of trips to events and shows in the UK and Europe. One of these is described below. For 2001 it is hoped that work demands will reduce enough for me to compete in a further season of circuit racing. One of my outings for 2000 was at Zolder, where there is a large car show attended my mainstream and low production vehicle manufacturers with cars demonstrated on the circuit over a summer weekend. I had been here before in 1997, but conflicts with the race calendar prevented my attendance in the intervening years. So now, I was back! Just to make things more entertaining, I arranged for Gerry Hawkridge to take along a set of slick tyres for my car. Driving people at speed around the circuit all day on slicks was a real blast – for both driver and passenger. It didn’t go down so well with the Lotus Elise/Exige/Esprit crowd, nor the Toyota MR2 drivers, as the Strat ran rings around them all. My car was the fastest thing on the track, not fazed at all by the Caterhams, Cobras, Vipers, Corvettes, nor the GT40, Renault Saloon racers and a Mitsubishi Evo 6 that were all also on slicks. On the second day, the track started out wet so I reverted to my Toyo road tyres. I then had to stay on them once the dry line appeared as the Saturday fun had worn the slicks down to the canvas! This would seem to have been a catalyst for the previously-defeated cars to show that it was the slicks that gave my car its performance, so I again had to prove how fast the HF3000. Even on road tyres, it still beat other cars that were on slicks. Officials confirmed that I had the fastest car there on both days. Not bad for a fun weekend abroad – I wish I could fit it in every year. Although I have achieved a good record with the existing car, it was not originally built to compete at the level in which I am using it. As long as it remains a road car, I have a disadvantage against the top-spec circuit racers that are set up with stiffer suspension, high revving, more powerful engines and a single purpose in life. Since I do not wish to change the current car to the degree that it is only usable on the circuit, I am in the process of building a new car. This is another Hawk HF3000 and still retains the accurate replica body and suspension design of the current car. However, it is a bit special and should probably have the designation ‘LWR’ or similar added to its name as it really is a lightweight racer (unfortunately the same cannot be said of the driver!). The chassis has been fabricated to save weight and increase strength and stiffness wherever possible. Driver protection has also been improved in the process, although the original kit design has been unwittingly ‘crash tested’ by some owners with very good results in the past. The bodyshell uses a Kevlar/Carbon material and is a fraction of the weight when laid up in standard GRP. The motive power will come from another Alfa Romeo V6, but this time a 24-valve unit that is having a serious hike in power output with the use of a throttle body injection system to replace the standard Bosch hardware. The intention, which is realistically possible, is to get close to double the power-to-weight ratio of my original car. That should result in more fun for the driver, since the earlier car is no slouch!